Contemporary performance was impacted by the renewed necessity of confronting the real that manifested itself in every area of culture during the last decades. This necessity materialised, first, in productions that once again, dealt with the representation of reality, assuming the controversy brought by ‘representation’ and the complexity of reality. It also created the space for works in which the real bursts onto the stage, challenging not only representation, but also the construction of reality. Finally, this necessity of confronting the real produced works that challenged initiatives of intervention, whether in the form of actions that attempted to turn the spectator into the participant of a formal, collective construction; or in the form of direct actions on a space not delimited by artistic institutions. The turn towards ‘realism’ on the European stage signalled the end of an era marked by certain melancholy, in which post-modern critics focussed their attention on condemning the mechanisms used by structures of power and mass media to produce a ‘simulacral’ (Baudrillard) or ‘transparent’ (Vattimo) society. Meanwhile many artists and arts institutions were more inclined to join in with the criticism of culture, but not to consider the decidedly complex task of constructing realities that complied with tensions of the real. It is not about a naïve return to the past: over the last few centuries both experimental and social sciences have shown that what we call reality is always a construction. Here, what is sought is not ontological coherence, that Reality is identical to its representation. What is important is that reality works according to physics calculations or social laws. Furthermore, the act of exclusion inherent in all representation must be taken into account. To represent reality without denying all its complexity might require, just as in quantum mechanics, to consider four or more dimensions. The fourth dimension, regarding the image, could be time; regarding text, it could be the body; regarding movement, language; and so on and so forth. The first two chapters, ‘Reality and the Visible’ and ‘Real and Virtual’ suggest a revision of the different modes of realism and the articulation of the terms ‘the real’ and ‘reality’ within those modes of realism. The ways in which image has been represented throughout history in various media (photography, cinema, television, virtual reality) are used as point of departure to analyse different conceptions of realism: Antoine’s photographic realism, Stanislavski’s impressionism, Brecht’s dialectic dramaturgy (and its visual actualization in William Kentridge’s work), the critical baroque style of the Wooster Group or the ironic hyperrealism of directors such as Ostermeier and Platel. ‘The Irruption of the Real’ and ‘Iconoclastic Theatre’ consider the centrality of the body, from Artaud’s reflections on the body as a dramatic space, to the theses put forward by The Living Theatre of an actor that does not abandon his reality. The Living Theatre’s style would influence some of Georg Tabori’s or Albert Vidal’s works that draw, consciously or not, on the radical practices of body art. These practices might be connected with the corporeal, iconoclastic cinema of Lars von Trier. Iconoclasm, associated with the search for the real as something traumatic, would reappear in the work of Óskar Gómez Mata and his idiosyncratic version of ‘embodied thought’, Reza Abdoh’s iconoclastic performances, in the pre-tragic theatre of the Socìetas Raffaello Sanzio and its questioning of representation, and the abject plays and stagings by Rodrigo García and Angélica Liddell. ‘At the Limits of Representation’ approaches this question in the face of death and illness. The representation of private death, addressed by Wim Wenders in Lightning Over Water, was the start of a journey through images of illness and death in contemporary art and theatre. The question of the relationship between private and public came as an inevitable theme: the AIDS epidemic would multiply the reasons for transferring private experiences of the disease into the sphere of political discussion, as Reza Abdoh did, especially in his New York works. The chapter closes with a reference to Antonio Araujo’s Teatro da Vertigem and his treatment of Paradise and Hell in site-specific locations. In ‘Genocides’, the viewpoints of Atom Egoyan in Ararat (about the Armenian genocide) and of Peter Weiss and Erwin Piscator in Die Ermittlung / The Investigation (on the Holocaust) would introduce the study of works that bring together many questions about the real, the construction of reality, the understanding of otherness and the comprehension of another’s pain: an example of this is Rwanda 94 by Groupov, a work that came out of the creators’ reaction to the Tutsi genocide. Next to this monumental work one could juxtapose two questionings of representation with different takes on the individual vs. whole articulation: Ong Keng Sen and Rabih Mroué. The layering of ‘History and Memory’, together with the layering of public and private, constitutes a common starting point for the performances of many Latin American collectives created in the sixties and seventies (TEC, La Candelaria, Escambray, Yuyachkani); for them, the reinstatement of past events is in itself a tool of social intervention. Military dicatorships, internal wars and violence during the last three decades of the twentieth century urged a new confrontation with these issues. The collaboration with activist groups and social movements (Las yeguas del apocalipsis, grupo Etcétera) was followed in the recent years by a more performative and personal appropriation of history(ies),as can be seen in the works of Lola Arias and Lagartijas tiradas al sol. 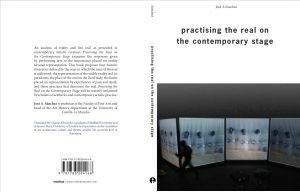 The following two chapters, ‘Performance of the Others’ and ‘The Real is Relational’ approach those practices that shatter the idea of representation and intend an activation of dialogue or conflict with the spectator. The will to give voice to others is continued in the work of those who directly attempted to make others act by means of revolutionary participative practices or through subversive games thought up as exercises in affirmation or resistance. Boal’s proposals introduce the study of series of authors that engaged themselves in participatory and game practices, guided by a political or social aim: Armand Gatti, Sara Molina, Ann Carlson, Maris Bustamante and other performance artists. The final chapter, ‘Essayism and representation’, is concerned with the new stage genres that have come out of the conjunction of film documentaries, relational practices, literary essay and social or political activism. ‘Essayism’ as practised by Roger Bernat, Héctor Bourges or René Pollesch leads to new forms of documentary theatre executed by the directors of collectives like Rimini Protokoll and Teatro Ojo, or works of relation-action by Jesusa Rodríguez, Angélica Liddell, Leo Bassi or Roger Bernat. The work of this last creator, Amnesia de fuga / Flight Amnesia (2004), could be understood, both from a social and visual point of view, as an irreverent recovery of 19th century realism. ‘Theatre and reality’ works as an attempt at a conclusion. The first section follows the transformation of the ‘reality criteria’ in parallel with the advance of technological media to produce and reproduce reality. The second section focuses on the consciousness of the body and the growth of an integral idea of human being over the past century. The third section proposes a reflection on times and temporalities and how our experience of time affects our concepts of reality in performance. The last section focuses on relations, goes back to the idea of reality as inter-subjective relations and recovers the concept of ‘theatricality’ as a tool for the study of the social field. The book closes with an appendix, ‘Ethics of Representation’, unpublished in the Spanish versión. The first version of this text was presented in the 2nd International Theatre Studies Conference, ‘Indisponer la escena’ / ‘Upsetting the stage’, organized by University of Antioquia (Medellín, Colombia, 16/03/2012) and resumes some of the topics explored in the previous chapters. Departing from an analysis of the naïve representation of ‘social theatricality’ undertaken by Jean Renoir in La carrose d’or / The Golden Coach (1952), the differing concepts of ‘representation’ that meet in stage work and social and political life are analysed. The question that guides the text is ‘under what conditions does an actor earn the right to representation?’ and ‘what can they do with representation?’ The analysis of a production by Angélica Liddell is used to introduce the final topic of reflection: the renouncing of representativity in the work of Rabih Mroué and Lina Saneh, and the appearance of an ‘ethics of care’ in Mapa Teatro’s stage proposals.